Congratulations to our new Hall of Fame inductees! There was a heck of a party inside the Horseshoe Southern Indiana Tuesday night, despite the worst ice storm in recent memory that paralyzed the region outside. 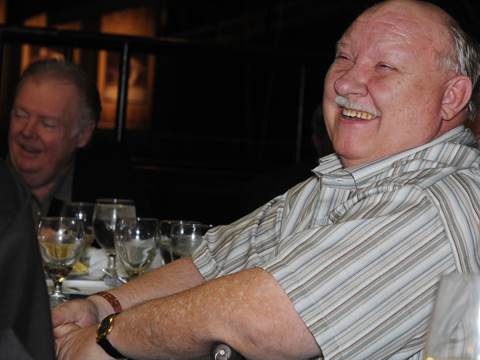 The late legendary player Marvin Henderson and living legends of action Jack Cooney and Jimmy ‘Flyboy’ Spears were the featured honorees at the fifth annual One Pocket Hall of Fame dinner at the recently concluded 2009 Derby City Classic. Fittingly, the banquet tables were eight of the Diamond tournament tables, fitted with custom made dining table conversion tops, and then dressed for the occasion by the Horseshoe catering staff. 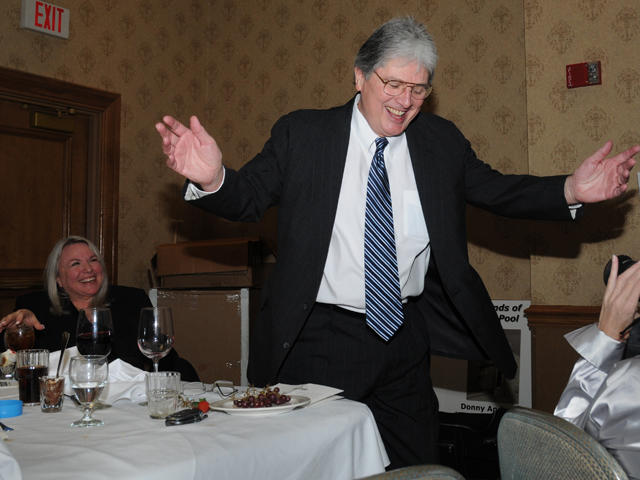 Despite short-staffing caused by the ice storm, and tight time constraints due to the ongoing tournament need for those eight tables, the Diamond crew and hotel staff whipped the room into celebratory condition just in time for the 6pm social hour. Special thanks goes to Greg Sullivan, who personally shepherded this rapid transition. Despite the storm and the economy, there was a packed house once again for this highlight event in the world of pool action. As co-master of ceremonies, Grady ‘The Professor’ Mathews and Freddy ‘The Beard’ Bentivegna regaled the crowd with entertaining stories from years past. First up was the posthumous induction of the ever popular Marvin Henderson. Marvin was the Jansco Brother’s Stardust One Pocket winner in 1968, and for years one of the very top all around players in the arena of after-hours pool and billiards action. 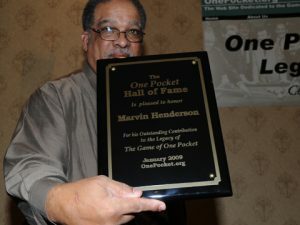 Marvin was remembered for his silky smooth stroke, as well as his elegant personal style, which together brought a unique dignity and talent to the game, and the One Pocket Hall of Fame is honored to welcome him. This year’s Lifetime Pool in Action honor went to Jimmy ‘Flyboy’ Spears. Flyboy spent a career as one of the best known big action players of his day, and it seemed like every great player at the banquet had a story about matching up with him. Next up was the elusive One Pocket hustler, Jack Cooney, who contrary to standard hustler protocol, showed up at the banquet with a large and enthusiastic rooting section, including rising One Pocket star Scott Frost, who took a turn at the podium himself. Jack modestly deflected a lot of the credit for his successful road career toward his partner Barbara. This year’s honoree for Bank Pool, Tony ‘Fargo’ Ferguson, was one of many Kentuckians caught in the unusual ice storm that blanketed the state. 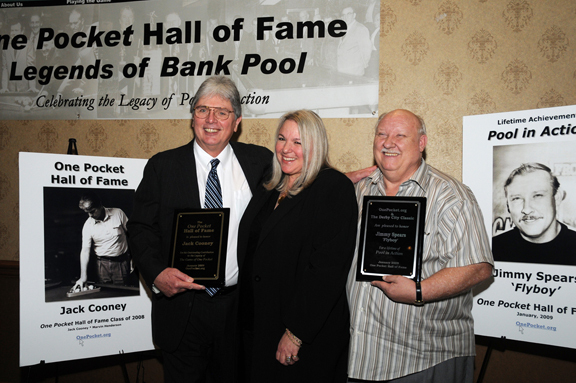 Unable to make the drive himself, his friend and fellow Bank Pool Hall of Fame member Vernon Elliott accepted his plaque on his behalf. Prev:2008 Hall of Fame votes are in!